Tasty Tuesday – Pumpkin Pasta | Who Are You Calling Crafty? Blend ingredients in a food processor until it forms a ball. Sprinkle some flour on your bench and knead pasta dough until it’s smooth. Roll out or run it through your pasta machine. 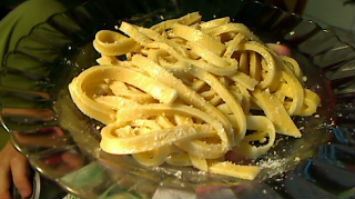 Hopefully you have plenty of ideas for making your own home made pasta. If you’ve tried our homemade pasta recipe, or if you have other recipes please feel free to share them using the form below. Cook in salted rapidly boiling water for 6-7 minutes, drain and serve. « November FaveCrafts Blog Hop!